After two decades of working in the law and recently notching up the same amount of time in politics, the former foreign minister has forged formidable careers in two major boys' clubs. But on Tuesday night, the West Australian MP delivered perhaps her most powerful speech yet - and opened up about her "painful" decision to depart the foreign affairs portfolio. "Two months ago - not counting - I had to make what I think was one of the hardest decisions, to resign as deputy leader and then resign as foreign minister and leave the cabinet," Ms Bishop told the Future Women dinner. In a rousing keynote address about female leadership, Ms Bishop also spoke about her time as the lone woman on former Prime Minister Tony Abbott's frontbench. Summing up her observations of women in Canberra over 20 years, she concluded: "If you're trying to be a man, it's a waste of a woman." With that, she automatically received a cabinet position - foreign affairs. There was "not one" other woman in Mr Abbott's senior leadership time. "And yes, it was lonely and there were times when I found it very frustrating. I was continually interrupted. Can you guys not hear us or something?" she said. "I found that I would come up with idea, a proposal or an issue, and they would move on to the next person, and about three down someone would say exactly what I said, exactly what I said, and the guys would go 'genius, let's do that'." "We would say, 'don't interrupt, she's speaking', or, 'why have you just said that, (she) said that five minutes ago'. It was reminding them that women's voices deserve to be heard." At several points, she was met with cheers by those in the crowd - a cohort of powerful women spanning business and community leadership, and including outgoing Liberal MP Julia Banks, who quit over alleged bullying during the leadership challenge. 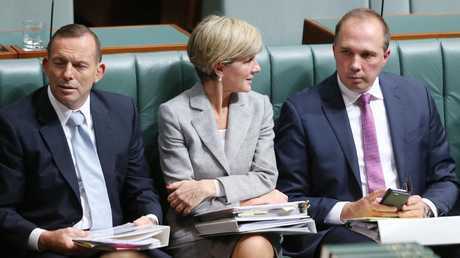 Julie Bishop was the only woman in former Prime Minister Tony Abbott’s Cabinet. 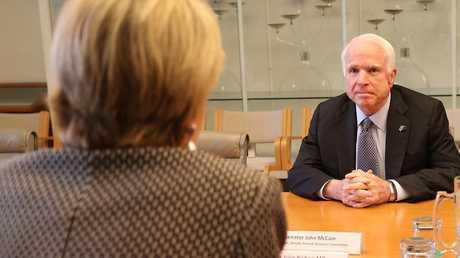 In the final term of John Howard's government, Ms Bishop was appointed the minister for aged care. On her first day, she received a phone call from "a senior male member of the PM's staff" with some instructions on how she should approach the role. "He said, 'OK Julie, out with the power suits, no more corporate lawyer image, you're now the Minister for Aged Care, I want to see cardigans and frocks'," Ms Bishop recalled. "I obliged. And then after a while, I thought, this isn't me. Why am I dressing to please somebody else? I love fashion, wear what you want, be who you are." "Over time, we started meeting formally. We would often comment about the contrast between meetings when we got together and the more usual meetings where we would be perhaps the only or one of two women in a room." "I was the only female, along with Federica Mogherini, who is the high representative of the European Union, and the rest were male," Ms Bishop recalled. 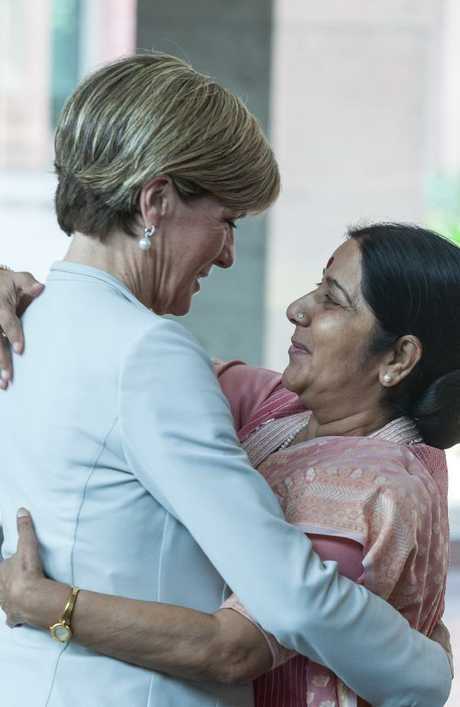 "That night, I went to a meeting of the female foreign ministers … there were about 25 of us. We discussed the same topic, the same facts, and there could not have been a greater contrast in tone, style, outcomes, narrative and the way we saw the world." 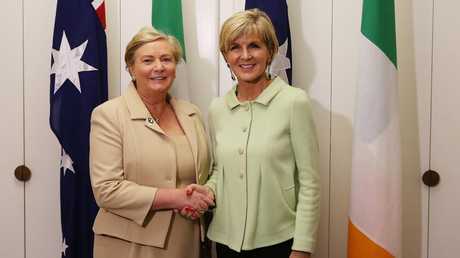 Julie Bishop with Deputy Prime Minister of Ireland Frances Fitzgerald at a meeting in Canberra. "Madeleine Albright, Condoleezza Rice and Hillary Clinton. These were three women who gave me ideas and advice on the challenges they faced in an increasingly challenging world, and what they were trying to do to overcome them." They were women who some might "describe as woke", Ms Bishop said, the millennial slang word for being enlightened and aware. "Always back other women. They are not your enemies. They might be your competitors but they are not your enemies." Then Foreign Minister Julie Bishop and her shadow counterpart Tanya Plibersek at the National Press Club in Canberra. Picture: Ray Strange. "Men are more likely to be driven empirically to set team goals, they're less likely to focus on the individual and it's much more punitive and less sensitive. They set goals and judge the team and call them to account at every step," Ms Bishop said. "The research concludes that women's leadership style is transformative, men's style is transactional. "Of course, there are strengths and weaknesses in both. But it leads me to conclude: if you're trying to be a man, it's a waste of a woman." After stepping down as foreign minister, Ms Bishop spoke at an Australian Women's Weekly lunch about the sometimes toxic nature of politics. Despite her experiences, she insisted her remarks were not a sign that she was "walking away" from a sense of optimism for women in power. Instead, Ms Bishop said she hoped to encourage women "to aspire, to inspire, to success, to be fulfilled and the be empowered". "No nation will reach its potential unless it fully engages with and harnesses the skills and talents and energy and ideas of the 50 per cent of its population that is female," she said. "And in the case of Australia, that's 51 per cent." There has been much speculation about what Ms Bishop's next moves might be. Some pundits in Canberra say that should Scott Morrison's government lose the election, Ms Bishop is a contender to be Liberal Opposition Leader. 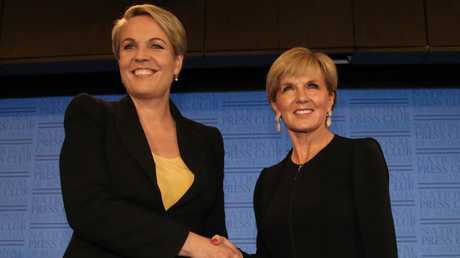 As she was introduced on Tuesday night, it was remarked that many in the room would've liked to have seen Ms Bishop as the current PM. "Never let anyone define who you are and what you can achieve," she said. "You set your own standards, you set your own benchmark and you strive to meet it. Ignore those whose standards they wouldn't or couldn't meet themselves. Be authentic, be yourself."